Not a Research Institution? We Beg To Differ. Yet, spend any amount of time with today’s academic leaders and students and you will quickly discover that today’s research is an entirely different game altogether, a creation of knowledge that is vital to both the student experience and business and community transformation. The complexity and fast pace of today’s world means there’s no shortage of problems to go around, providing plenty of opportunities for discovery for faculty and students at universities of all sizes. Community and industry connections are critical, both in helping to identify problems and invest in the research. From psychology to biology to business administration to social sciences, research is everywhere on campuses of every size. While R1 research institutions command much of the attention when research is discussed, mid-size comprehensive universities like UW-Green Bay are also all in. 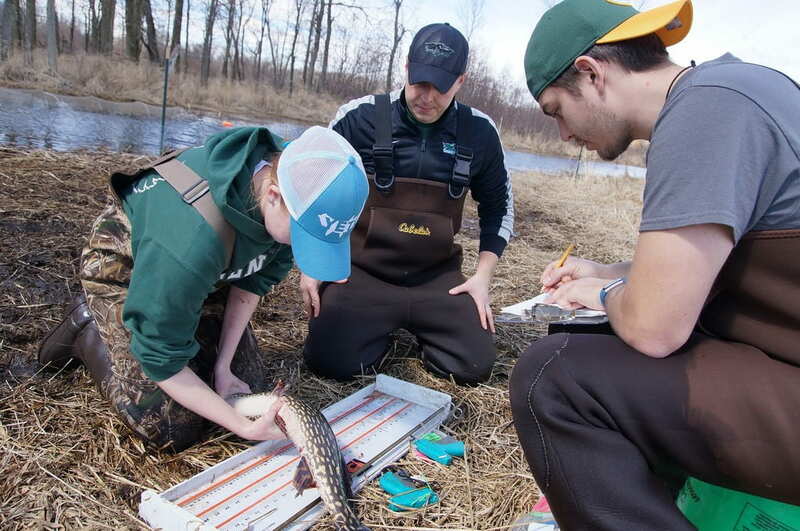 “Research conducted at institutions like UW-Green Bay surprises many in that it is taking place, is high quality and it applies faculty and student expertise to address problems and questions. Both basic and applied research is conducted on our campus, and both are equally valuable,” Dornbush notes. May 2018 graduate Amber Collegnon and UW-Green Bay senior Samantha Alger-Feser agree. The two (featured on the cover of Inside Magazine) partnered with UW-Green Bay Psychology Prof. Regan Gurung over the last year to research the growing field of brain games and their effect on memory or cognitive performance. Their research question: Does playing games have an effect on the cognitive performance of students? Their hypothesis: Students may study endlessly for an exam, but what if the actions they take in the ten minutes immediately before an exam can affect their exam performance? Could playing games improve learning? Previous research has shown that many classrooms are starting to incorporate game playing into their lessons to facilitate learning. But could playing non-educational games, such as Candy Crush, affect learning? The two hypothesized that students who play their own games would subsequently perform better on a quiz. Not only is research like Collegnon and Alger-Feser’s important for parents and educators who are looking to balance the use of technology at home and in the classroom, it’s also beneficial for student researchers and their future employers. The ability to identify and provide creative solutions to problems is a universally accepted requirement in today’s job market. Research experiences take students from concept to completion. Because of the group/cohort model used in the research process, research also creates communities, which is important to the research process. Environmental Science and Biology students had a field day monitoring fish at a restored wetland on the west shore of Green Bay. 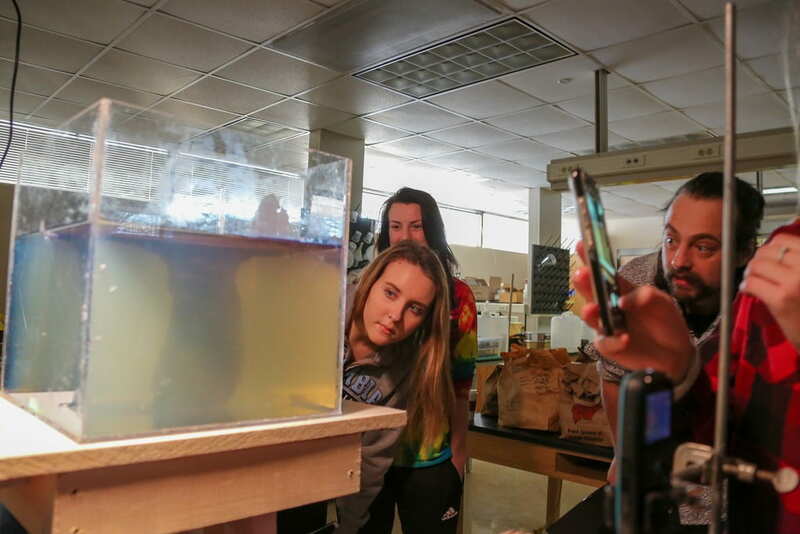 The students, under the direction of Assistant Prof. Patrick Forsythe, analyze, measure and tag fish, as well as conduct experiments to measure fish egg mortality. The Wisconsin Department of Natural Resources, Fish and Wildlife Service, Ducks Unlimited and The Nature Conservancy are regional partners. See more. “There are few things more rewarding than creating your own study, collecting data and finding significance during data analysis,” says Alger-Feser. “You can’t lose because no matter what the data says, you will learn something. The outcome might not always be what you hope for, like Brain Games, but nonetheless, we learned something.” Alger-Feser, a Psychology major, plans to graduate from UW-Green Bay in December 2018. She aspires to be a school psychologist. Professors Ryan Currier and Patrick Forsythe lead Environmental Science students through an experiment using gelatin to create “scaled down magmatic intrusions” (think volcanoes and the like) that mimic magmas from Earth. See more. Do negative stress events and coping affect memory of both mid-life and older adults? Can identifying and categorizing the microbial content of soil serve as a helpful tool to Midwest farmers? What new energy saving opportunities can a leading regional healthcare provider deploy to improve the sustainability of its campus and reduce its carbon footprint? Does gender moderate the relationships between shipping and return-shipping costs and subsequent purchasing intentions? Are university efforts to reintroduce wild rice as a native aquatic plant into Green Bay taking root? What funding alternatives can Wisconsin use to address its infrastructure crisis? Is the Boys & Girls Club Teens2Work program having an impact on homelessness and financial stability, and educational success of area teens? Can the support system of a student athlete impact their psychological well-being while in college? What effects does traumatic brain injury have on cardiac function? This piece originally appear in the Spring/Summer issue of Inside Magazine. This entry was posted in Leading & Learning and tagged CSET, NAS, research on September 21, 2018 by Kimberly Vlies.